So, I safely made it to England on the 31st of May, and it’s kind of sad for me to say but I don’t miss Finland that much. I miss the friends I made, of course. But, as for the country itself.. meh. If I want to see lakes and trees, I can just visit my parents’ house, where they own a fishing business for people to holiday. I don’t need to be completely engrossed in the stuff, haha. When I got back to England, I went straight to my University city, as I hadn’t seen some of my friends for a year! I really missed them, and I was spending most of my summer with the family anyway. In fact, me and my closest friends planned to go to Brighton soon after I got back.. and so Brighton we went! I have missed English Summertime, no matter how dull and short it may seem. And Brighton was a great place to experience such fab weather. 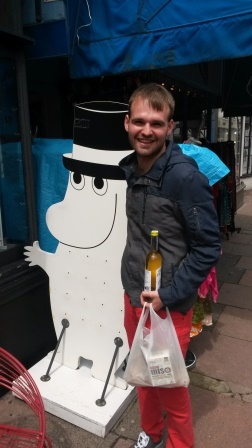 Finland is everywhere.. even Brighton! Anyway, I just wanted to do a quick blog for now, but I will blog later this month about the frantic times during exams (for you A Level finalists) and how to prepare for University. And also, about some amazing news lying ahead for me. But, I won’t give it away just yet.